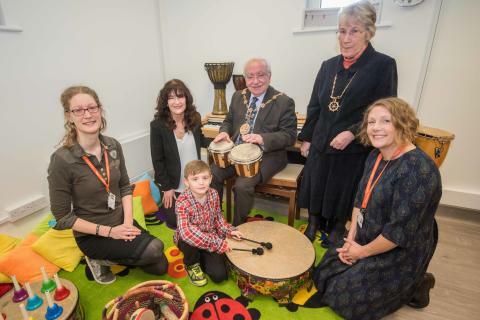 The Creative Therapies Room, unveiled on Wednesday by the Mayor and Mayoress of Gravesham is a carefully designed space for children with life-limiting or life threatening conditions to engage in play and music therapy and find comfort and distraction from pain or distress. Thanks to the generosity of long standing Corporate Partner and Property Developer - Berkeley Homes (Eastern Counties) and Bright Horizons Springfield Lodge, patients of ellenor can benefit from specialist musical instruments, sensory toys and play equipment which will encourage them to explore their experiences and feelings. The idea for the Therapies Room originated when Bright Horizons were visiting a member of their staff, an inpatient at ellenor Gravesend and they saw there wasn’t a dedicated space for children to access therapeutic play and music. They vowed to create such a space. Working together, Berkeley Homes (Eastern Counties), funded and carried out the building works and Bright Horizons provided brand new play equipment, furniture and soft furnishings to create the space we have today. Peter Smith, Managing Director, Berkeley Homes (Eastern Counties) says: “Berkeley Homes Eastern Counties are proud to support ellenor as their corporate partner for the past four years. We were delighted to be able to help them with this project, and it’s fantastic to see the room is already being put to great use”. Since the renovation in December 2017, the room is already in use by ellenor’s Play Therapist Jola and Music Therapist Petra, caring therapeutically for both children and their families. ellenor’s specialist Children’s Hospice at Home Care is provided in the comfort of the family home and spans across North and West Kent and the London Borough of Bexley. For a sick child, when treatment is needed, this can often mean leaving the comfort, security and proximity of the family home for treatment or respite at a hospital or hospice. 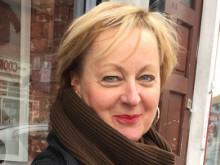 However, as a pioneer in the field of hospice at home care, ellenor enables children in Kent to receive the very best care and support they need at home, so they can stay with their loved ones.